Thomas Bullock Church of England Primary Acadmey is proud to be a Church of England Academy which is part of the Diocese of Norwich Education and Academies Trust. 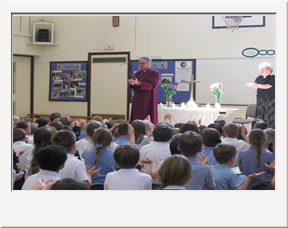 Being a Church of England Primary Academy, we have carefully developed a distinct Christian Ethos. From our daily acts of collective worship where the whole school gathers together to our six christian values which underpin everything we do. The Academy aims to serve its community by providing an education of the highest quality within the context of Christian beliefs and practices. It encourages an understanding of the meaning and significance of faith and promotes Christian values through the experience it offers to all its pupils. Thomas Bullock Church of England Primary Academy maintains strong links with All Saints’ Church, which is located in the village. Collective Worship takes place daily at 8:55, with the whole Academy joining together in the hall. We believe that this shows our belonging to our Academy family, the Diocese of Norwich Education and Academies Trust family and the Christian family. Collective worship is lead by either the Headteacher, Deputy Headteacher or R.E Leader, with weekly visits from the Rev’d Gill Wells. In addition to our morning collective worship, once a month, a special assembly is led by Norfolk Youth for Christ. For special Christian Festivals, such a Harvest, Christmas and Easter, the whole school walk to All Saints Church where we are joined by families to celebrate the occasion. Our school has six Christian values which form the foundation to everything we do at Thomas Bullock Church of England Primary Academy. These six values come from 'Values for Life', devised by the Ely Diocese and recommended by Diocese of Norwich Education Board, and form part of a three year programme of collective worship at our Academy.